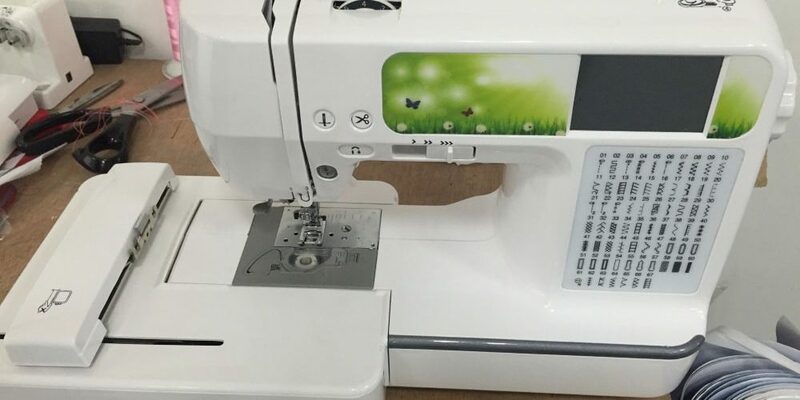 You may be looking to use sewing machines for beginners or a serger sewing machine knowing the process of using the unit is extremely important. If you don’t do so you might end up messing up even the easiest sewing project. The steps below would help you get acquainted with the machine and would also teach you how does a sewing machine work. Take a careful look at the sewing machine you will be using and locate all its vital parts. You must also gather knowledge about the function of those parts. Read on to find out more. This is the most vital part as without the power switch you will not be able to turn the machine on. The location of the power switch would vary depending on the model you are using. However, most units have it on its right side. It’s basically a petite metal or plastic pin sticking out of your sewing machine’s top. The size of the spool pin remains more or less the same irrespective of the fact whether you are using a kids sewing machine or a heavy duty sewing machine. As its name suggests, it holds the thread spool you will be sewing with. This part of the machine is a metal structure and is responsible for directing the thread towards the bobbin winder from its spool. You will find the thread guide on your sewing machine’s left. This one is located on the spool pin’s right and is made either of metal or of plastic. Beside the bobbin winder, you will find a tiny horizontal wheel. The technical term used for that wheel is “bobbin winder stopper”. These two parts work simultaneously along with the spool for a winding thread around the bobbin. The location of these buttons would change depending on the type of sewing machine you are using. In most modern-day units you will find the buttons adjacent to a tiny screen (usually located on the machine’s front). You will need these buttons to select the kind of stitch you would like to create, its direction, and its length. You will most likely find it at the front of the machine’s left side. The lever will have arrows and numbers printed beside it; you will have to thread your machine following those arrows and numbers. It’s a tiny numbered wheel located close to the thread take up lever. The dial controls the thread’s tension as you will sew. The needle clamp screw is responsible for holding the needle tightly when sewing. You will find this metal structure underneath the sewing machine’s arm. Look for this metal attachment beneath your sewing machine’s needle clamp screw. The presser foot ensures that the fabric you are working on remains in place when you are sewing. Find the silver plate located just under the needle of your sewing machine. The technical term used for that plate is “needle plate”. A sewing machine’s bobbin cover is located under its needle plate, while the bobbin release is situated just beside the bobbin cover. Here, it must be noted that the term “bobbin release” is used for a pin or button that performs the job of placing the bobbin properly before sewing. You will find it beneath the machine’s pressure foot. It’s a tiny metal guide that would move the fabric you are working on as you will sew. You may be using the a good sewing machine available on the market currently; but if you fail to set it up properly, you will never get the desired results. The pointers below would teach you how to set up the machine. Step No.1 Always place your sewing machine on something very sturdy. It may be a desk, a counter, a table, or a customized sewing cabinet. Place yourself on a chair or stool that is high enough to let you operate the machine comfortably. When placing the machine, it’s important to make sure that you have its body on your right and the needle end on the left. Step No.2 Next, you will need to install the needle with care. The needle should be inserted deep into the machine’s post. This should be followed by tightening of the thumbscrew. Out of the two sides of a needle, one is usually flat and the other one has a groove. The side with the groove should face the direction the needle gets threaded from. Step No.3Sewing machines use two different thread sources, top thread and lower thread (kept on the bobbin). Your next job would be winding the bobbin and inserting it. Step No.4 Next, you will have to learn how to thread a sewing machine. Unwound the spool present on the machine’s top and attach it to the machine’s needle. Depending on your preference, you may thread the needle from left to right for from front to rear. Step No.5 Once you are done with threading the machine, you will have to get both the threads out. Use the left hand for holding your needle thread tight and pulling it towards you. You will have to use the other hand for making a complete needle revolution (you will have to turn the machine’s hand wheel in your direction for making the revolution). Finally, pull the needle thread up. As a result of the above actions, the needle thread will have the bobbin thread looping over it. Pull the loop from any one side for bringing the tail of the bobbin thread up. Step No.6 If you complete the above steps perfectly, it would mean that you have successfully set your sewing machine up. Now, just plug the unit, switch it on, and start working on your sewing projects. After gathering knowledge about the location and function of various parts of a sewing machine and finding out how to set the unit it, you will have to learn to sew. It might be a leather sewing machine, a sewing machine for quilting, or one of those high-end embroidery machines, the process of sewing with them would be more or less the same. Read on to know more about the process. You will have to begin by picking a medium or straight stitch length. The manual you will get with your sewing machine would surely have detailed discussion on how to select suitable stitch lengths. We would like to mention that the majority of the seams would require you to use straight stitches. The other stitch that is used pretty frequently is zigzag stitch; it’s primarily used for ensuring that the edges don’t get frayed. You should start sewing your actual fabric right away. Begin by practicing on a scrap material. Ideally, you should pick a woven material instead of a knitted one. In addition, make sure that the fabric is not very heavy (you should avoid sewing on flannel or denim when starting out). Line the fabric up beneath the needle. Place the material in a way so that most of it remain on the machine’s left. Bring the machine’s pressure foot down onto your fabric. A good machine will surely grip the fabric firmly. You are now ready to start sewing. When making the initial stitches, you must use your hands for holding the slack ends of the bobbin and needle threads. Once the initial stitches are done perfectly, you can use your hands for controlling the sewing machine and the fabric. When sewing, you will have to manage the machine’s speed wisely. For that, you will have to use the machine’s foot pedal, which plays the role of a speed control. For getting the unit going, you should ideally begin by pushing the pedal slowly. Some sewing machines come equipped with knee bars instead of foot pedals. In such cases, the user should use her knee to push the bar to her right. Use the unit’s balance wheel (it’s located on the top right of the sewing machine) for getting it to spin or for moving the needle with your hand. Your machine will ensure that the fabric changes its position automatically. Guide the fabric through your sewing machine both by forming curves and in a straight line. Never commit the mistake of forcing the fabric or pulling it when it is approaching the needle. If you do so, you might end up breaking the needle or stretching the material. Such actions might also clog the stitches up. Next, you will have to find the machine’s lever or reverse button and use it. This part is used for reversing the direction in which the sewing machine feeds. The lever ensures that the material moves in the user’s direction as she sews. Most advanced units come equipped with spring-loaded levers. Such units would require you to hold the lever down for sewing in reverse. For pulling the fabric out, lift up the needle using the machine’s hand wheel; also, raise its pressure foot. Once the sewing job is over and you have removed the fabric, you will have to cut off the thread. If your machine has a tiny notch behind the post holding its pressure foot, cutting the thread is comparatively easier. You will only need to hold the two ends of your thread and bring it down on that notch for cutting the thread. If the machine you are using doesn’t have any such notch, you will have to use a pair of scissors for trimming the thread. Go for the second option if you want the cut to be clean and flawless. To learn how to sew, you must also know how to sew a seam. For practicing this craft, you will have to pin the right sides of two pieces of cloth together along the edge. When practicing, you can surely opt for just a one piece of fabric. However, we would advise you to sew two as most jobs would need you to attach two or more pieces of cloth together. Seams can travel in any direction. However, if you want your sewing project to be flawless, you must try to keep all major seams parallel to the fabric’s original weave. In case of printed materials, you should also keep in mind the direction in which the prints are arranged. Next, you will have to practice sewing sharp corners. For turning the corner, you will need to bring the needle down using the machine’s hand wheel. The discussion above must have helped you to learn how to use a sewing machine. However, it’s important to remember that you cannot become an expert of the field just by learning to use the machine. The next thing you must do is gathering knowledge about different sewing machine models available on the market. That’s because different machines come with different kinds of controls. For instance, some machines feature a dial for stitch width adjustment, while there are several others that don’t feature any such dial. Machines belonging to the second category work by adjusting the stitch width automatically. On the other hand, when using a unit belonging to the first category, you will have to leave the stitch width at zero for making straight stitches and rotate the dial as required for other stitch types. Another thing you must learn for using your sewing machine successfully is repairing minor faults. However, we would not advise you to rely on do-it-yourself techniques for mending major issues with your machine. Such issues should always be handled by professionals.As a beginner, you should keep reading sewing tutorials and try out the tips and tricks provided in them for sewing a piece of scrap material. You should start working on fresh fabrics only when you see yourself completing sewing jobs without any hitch. Are you wondering what kind of projects you should begin with? It would be a good idea to begin by sewing a few table covers and curtains. Then, gradually start making shirts and dresses.